Overview: Surf's up, dude! With our latest 5 reel, 15 pay-line video slot, there are three ways to win: Lucky Break, Big Break and Munky Wax! Just like a real-life surfer, you sometimes have to sit through the smaller waves until you receive the 'big one' - and from there, it's all yours with generous winnings and great prizes. 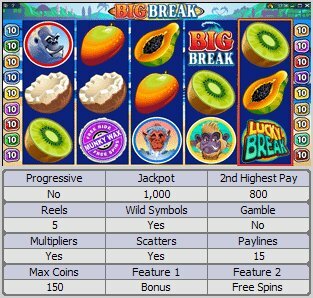 The Big Break Video Slot is full of free spins, multipliers and bonuses, all wrapped in a comical surfing theme. Similar Slots: If you like Big Break, you might like these other 5-reel slot machines: Curry in a Hurry, Lady of the Orient, Lucky Eggsplorer, Supe It Up, Wealth Spa, Winter Gold.